How can it be that you receive dozens of personal emails and texts every day but have nothing to do come Saturday night? Or that you’re constantly juggling a jam-packed schedule while always feeling that something essential is missing? Who took the social out of your social life? Life is Friends solves these mysteries and more. 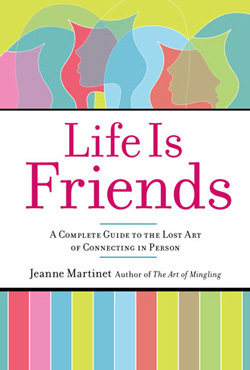 With an attitude that’s savvy, sympathetic and down-to-earth, author and social guru Jeanne Martinet provides a practical game plan for relearning the rapidly disappearing art of socializing. Forget twittering, IMing, Facebook and Internet “relationships.” When it comes to building real friendships, there’s simply no substitute for live, in-person bonding. Martinet offers a full gamut of strategies and techniques for socializing, from making that first connection with someone to maintaining a long-term relationship. The focus, however, is on entertaining — on how to be a great host and a great guest — because sharing one’s home and lifestyle is the most important element in nurturing intimate, rewarding friendships. So read Life is Friends. And then, go ahead: Invite people over.